Other common types of multimedia files that you might want to embed on a page include Flash animations, Acrobat PDFs, Real audio and video, Scorch sheet music, and more. Go to the Web site of the company that develops the player for the multimedia files you want to embed. 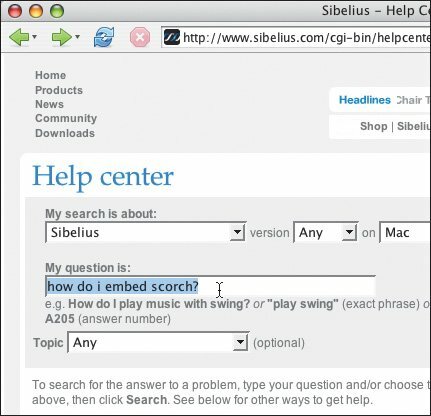 For example, for Scorch, go to Sibelius' site (http://www.sibelius.com). Look for developer information on the Web site or search for "embed". Most plugin developers provide information on their use. If you can't find details on the site, try looking at the source code of a page that contains an embedded player. Almost all plugin developers offer the common but hardly standard object/embed combination in order to satisfy both Internet Explorer and its nonstandard classid attribute as well as the rest of the browsers that can't handle it. If you want to avoid using the embed tag, try experimenting with the data and type attributes in the object element and a src or url param element with the URL of the desired file. And let me know what you find out (http://www.cookwood.com/html/contact.html).